Historically, science has supported the development of the weapons industry and the war economy. “Science for Peace” indelibly requires reversing the logic whereby commissioned scientific endeavors are directed towards supporting what President Eisenhower called “The Military Industrial Complex”. What is consequently required is a massive redirection of science and technology towards the pursuit of broad societal objectives. In turn, this requires a major shift in what is euphemistically called “US Foreign Policy”, namely America’s global military agenda. The world is at a dangerous crossroads. The United States and its allies have launched a military adventure which threatens the future of humanity. Under a global military agenda, the actions undertaken by the Western military alliance (U.S.-NATO-Israel) in Afghanistan, Libya, Yemen, Pakistan, Palestine, Ukraine, Syria and Iraq are coordinated at the highest levels of the military hierarchy. We are not dealing with piecemeal military and intelligence operations. Major military and covert intelligence operations are being undertaken simultaneously in the Middle East, Eastern Europe, sub-Saharan Africa, Central Asia and the Asia Pacific region. The current situation is all the more critical inasmuch as a US-NATO war on Russia, China and Iran is part of the US presidential election debate. It is presented as a political and military option to Western public opinion. The US-NATO military agenda combines both major theater operations as well as covert actions geared towards destabilizing sovereign states. America’s hegemonic project is to destabilize and destroy countries through acts of war, support of terrorist organizations, regime change and economic warfare. U.S. and NATO forces have been deployed in Eastern Europe including Poland and Ukraine. In turn, military maneuvers are being conducted at Russia’s doorstep which could potentially lead to confrontation with the Russian Federation. The U.S. and its allies are also threatening China under President Obama’s “Pivot to Asia”. The U.S. led airstrikes initiated in August 2014 directed against Iraq and Syria under the pretext of going after the Islamic State are part of a scenario of military escalation extending from North Africa and the Eastern Mediterranean to Central and South Asia. “The World will note that the first atomic bomb was dropped on Hiroshima a military base. That was because we wished in this first attack to avoid, insofar as possible, the killing of civilians..” (President Harry S. Truman in a radio speech to the Nation, August 9, 1945). In this civilization, true democracy is impossible. I only have a few minutes to convince you of the usefulness of a new term; a term that will help us understand the dangerous times we are living in as well as the related struggles on a deeper level, that is, from the roots. The time for lighthearted jokes and uncertainties is over. The “storm” predicted by the Zapatistas is approaching faster than expected. Our confusion needs to end. The world system that is threatening all of us is based on a strange phenomenon I was only recently able to fully grasp, namely a “hatred of life”. (2) This hatred has indeed become a system, society, global civilization. It is embodied in all of modern civilization’s institutions: in economics as much as in politics, in science as much as in gender relations, and, especially, in modern technology. There no longer exists a place where the hatred of life has not, literally, been poured into concrete as the basic idea and sensation of our existence. The hatred of life is no fleeting emotion or a mere individual or personal experience of a certain situation or moment. It is nothing less than hostility to life itself, which – and this is my thesis – has become the main foundation, driving force, and defining criterion for a patriarchal civilization dating back almost 5000 years. After a virtual ban of 30 years, the term “patriarchy” is now re-emerging. It was commonly used by radical feminists whose movement was destined to be destroyed with the arrival of neoliberalism. The appearance of so-called “gender studies” was a consequence of this. The term “patriarchy” was shunned and the advocates of gender studies soon rallied behind demands for “equality” within the present system. The goal was integration and a share of power – something the Left had been propagating for a long time. But the challenge lies in moving beyond a system driven by the hatred of life instead of (voluntarily!) turning into an ever more loyal accomplice in the massacres it is responsible for. It has been repeatedly suggested here that the patriarchal system is a system of death. That is not entirely correct. The patriarchal system is a system of killing, that is, of artificial death: ecocide, matricide, homicide in general, and finally “omnicide”, the killing of “everything”. Omnicide is already appearing on the horizon in the form of so-called “geoengineering”. Geoengineering has begun with the destruction of the planet itself, of Mother Earth and of her living order. Geoengineering intends to turn planet Earth into a gigantic weapon of war. (3) It uses new, “post-nuclear”, technologies of mass destruction intended to take control of the planet and its energies to employ “weather warfare” and “plasma weapons” among others. We always knew that the military was no institution expressing a love of life. But until recently we didn’t know that our civilian institutions were poisoned by the same perverse, illogical, and, in the words of Ivan Illich, “counterproductive” hatred of life. How can you hate life when you are a part of it? How can you hate yourself? And why? The sinister motive of hating life needs to be hidden. The unspeakable crimes that all patriarchies have committed against life itself, against children, women, and all human beings, against the earth, animals, and plants must not be revealed. The hatred of life is the reason and the rational justification for the violence against it; a violence that intends to prevent any rebellion or uprising of those not believing in the system it protects; a system that many would see as a grave assault on their dignity if they only recognized it. We are told that this violence is necessary for development, progress, and a better life for all of us. It is usually only understood and recognized by those who are directly affected by it. Even then, the promise of a better life is supposed to be a consolation, although any chance for a better life has, in fact, been sacrificed! Why do we so seldom recognize how flawed this logic is? Why do we so seldom recognize the blatant contradiction of sacrificing life in order to improve it? The project of replacing life with non-life could only be realized with the help of modern patriarchal-capitalist civilization and its machine technology. All of the earlier “alchemist” attempts to produce better, higher, and more divine forms of life had failed. Only modern technology allowed for the monstrous manifestation of the patriarchal project we are witnessing today. This is why I call modern patriarchy: “the Monster”! The Monster is not only characterized by exploitation, extraction, and appropriation. It is, first and foremost, characterized by transforming its possessions into their opposites, that is, into everything we call “capital”: value, money, machines, and hierarchical structures (following Marx). Supposedly, everything that exists today derives from so-called fathers; each origin is patriarchal and no longer maternal, deriving from a mother, from Mother Earth, matri-archal. Patriarchy is a new “technological formation” that produces and transforms everything that exists violently. It will not stop before everything has been annihilated. Capitalism is the modern form of materializing this utopian project of total transformation. When “pure” patriarchy arrives and even the tiniest matriarchal remnants have disappeared, we will all be dead. I hope that the men among you who before had difficulties with the term “patriarchy” can now see that it concerns you, too. I hope that you will decide to switch sides and join nature and women. Women are (still) closer to life, since life emerges from them. They are always the first victims of the hatred of life, but they are also closer to the truth of life. When women rise up, they rise up in the defense of life. It has always been like that. Today, women are rising up again against violence and for life, massively and all over the world. Everyone ought to follow them, embrace them, and love them for it. It is not them who are the threat, it is the Monster, the patriarchal “hydra”, an all-encompassing combination of capitalism, neoliberalism, colonialism, globalization, and militarism. What a great idea that would be! What joy it would bring! We could leave the patriarchal deception behind us and revive human dignity by rejecting this monstrous system. Without our participation and cooperation it cannot be maintained. Mother Earth or death! This is the alternative we are confronted with today. (10) From a common house to a common cause: liberating ourselves from the ludicrous hatred of life, a collective disease buried in our collective unconscious. Life is not here to be killed; it is here to be loved and defended! United Nations officials acknowledged, for the first time, the role peacekeepers played in the 2010 deadly cholera outbreak in Haiti that killed 10,000 people and sickened hundreds of thousands of others. The Office of Secretary General Ban Ki-moon in an email this week said “the UN has become convinced that it needs to do much more regarding its own involvement in the initial outbreak and the suffering of those affected by cholera,” reported the New York Times. For six years, UN officials refused to accept blame for bringing cholera to Haiti, but suspicions settled on a group of UN troops from Nepal who arrived after the January 2010 earthquake. Nepal had a cholera epidemic underway at the time and raw sewage from the latrines at the UN troops’ came was allowed to seep into an adjacent river. The earthquake crippled the capital of Port-au-Prince, killing 200,000 people, then the cholera outbreak sickened hundreds of thousands of others, and killing 10,000. An attorney who represents Haitian cholera victims who have filed a suit in US federal court seeking reparations from the UN told the Washington Post that acceptance of culpability could make it more likely plaintiffs will finally receive financial compensation. UN “peacekeepers” were deployed to Haiti following the 2004 ouster of then-president Jean-Bertrand Aristide. “This is a major victory for the thousands of Haitians who have been marching for justice, writing to the UN and bringing the UN to court,” said Mario Joseph, a Haitian human rights lawyer representing victims of the epidemic. The UN acknowledgment comes after top officials were provided a draft 19-page report by an adviser criticizing their handling of the cholera outbreak. The report written by NYU law professor Philip Alston, the special rapporteur on extreme poverty and human rights, will likely be published in September and present by Ban at the UN General Assembly in October. Alston wrote that the United Nations’ Haiti cholera policy “is morally unconscionable, legally indefensible and politically self-defeating, according to the New York Times. Alston went beyond criticizing the Department of Peacekeeping Operations to blame the entire United Nations system. “As the magnitude of the disaster became known, key international officials carefully avoided acknowledging that the outbreak had resulted from discharges from the camp,” he noted. When the outbreak occurred it spread rapidly in the muddy, crowded tent camps where Haitians had sought refuge after the quake. The disease continues to sicken Haitians, especially in rural parts of the country without access to clean drinking water. A new spike of infections has been reported this year. A recent report by Doctors Without Borders has raised the possibility the disease may have killed far more Haitians than previously estimated. The secretary-general stopped short of saying the United Nations caused the outbreak. The organization continues to hold the position it is immune from legal action as a result of the outbreak. Does Germany still owe Greece billions of euros in compensation for Nazi crimes in World War Two, or should bygones be bygones since Berlin has anyway given Athens billions as part of benefits and bailout measures? Greece continues to demand about €270 billion from Germany in reparation payments for atrocities committed by the Nazi government during World War Two. Athens said it could take legal action against Germany to receive the compensation. “Greece and its people will not forget the slaughter and war crimes of the Nazi army and demand tangible recognition by the German government. Greece will do whatever is necessary, mainly at a diplomatic level, and if necessary, at a legal [level],” Prime Minister Alexis Tsipras said earlier this week, during a visit to Kommeno to commemorate the victims of the 1943 massacre in the northwestern village, where Nazi troops killed 317 civilians. RT sat down with political theorist Marina Prentoulis, member of Syriza, and Eike Hamer, a political commentator from Germany, to discuss whether Greece can really claim the money 70 years after the war. 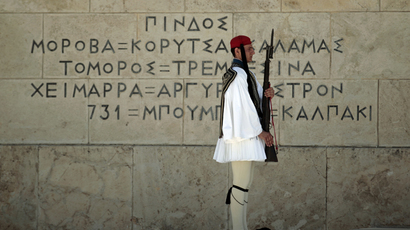 “The people of Greece will always have to live with the memories of the Nazi occupation. I would like to say that [on August 17] in 1944 we had a very dark anniversary for Greece – the anniversary of Kokkinia, a place in the western Athens, where the same day many years ago 20,000 people were gathered at the local square – 350 of them were executed, and 800 of them were taken hostages, and they were tortured by the Nazi army and the Gestapo,” she said. Eike Hamer argues, though, that the issue of fairness here is not the point, as “there is hardly any other country that has got as much money from Germany as Greece.” He recalled that back in 1960, West Germany paid 115 million deutsche marks to Greece as compensation for Nazi war crimes. Now the main point is to “live together again in peace and with respect to each other,” he says. “And now it is time to recognize that as comrades and for the good of the whole of Europe in order to be able to put this story in history and remember the horrific things that happened to Greece with not wanting to do anything like that again in the future; for peace and prosperity of Europe,” said Prentoulis. Since the 1960 compensation, Hamer argues, Greece has enjoyed advantages worth “a couple of hundred billion” euros. He referred to low interest rates, European – “mainly German” – aid and other indirect payments, including advantages Greece received because of having “many contracts” with Germany. “There is no other country in the world paying Greece that much as Germany through the EU, through other things,” he said. Prentoulis insists that it’s Greece that is being treated unfairly. “Greece is getting one of the worst treatments across the Eurozone,” she said adding that economic issues and war reparation payment should be differentiated. “But if you want to talk about the situation in Greece now, I have to remind you again about the 1953 London Debt Agreement, when a lot of countries, including Greece, decided to cut the debt of the German state by half and connect their repayment with a prosperity of the German state. This was an act of good will from the people of Europe,” she said. Greece, however, is being treated differently now, says Prentoulis. “The Greek people have been totally brought to the knees, once again because of austerity, because of the decisions of the conservative government of the EU, including the German one, and they are going on suffering since the crisis of 2008. You remember what happened with the Greek negotiations, and the whole Europe has been witnessing that,” she said. Russian and South Ossetian forces entered the territory en masse, where heavy fighting against Georgian, US-funded forces lasted until August 12th. The 5 day conflict played an important role for those who had orchestrated it, one which would guarantee the demonisation of Russia for the years to come. The footage of Russian tanks rolling in to Tskhinvali, in order to defend the territory from its attackers, was put on ‘repeat’ to play across mainstream media, never disclosing the cause of the narrative. Mr Saakashvili, then President of Georgia, was eventually held to account for his actions, but gave up his Georgian citizenship to escape prosecution. Georgian authorities inquired with Interpol to place Saakashvilli on the international criminal search list, however Interpol refused. Instead, the US puppeteers installed Saakashvilli, a wanted criminal in his own country, as Mayor of Odessa in the Ukraine. The laughing stock of the world has very little to do with the Ukraine, but the Columbia University graduate is too useful of a pawn for the US to cease working though him. A number of years after the Georgian conflict, a similar scenario was recreated in the Donbass region, Eastern Ukraine. The Russian military had learnt some lessons in regard to how damaging distorted media attention can be. The “Russian invasion” that was so insatiably awaited by Western mainstream media vultures never took place. 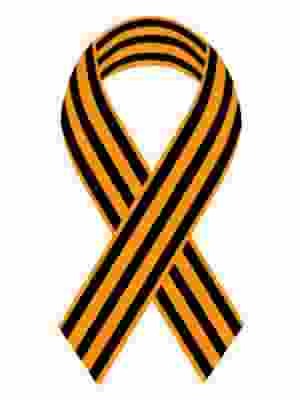 Instead, pro-Russian citizen militias formed within Eastern Ukraine, who continue to defend themselves to this day against the US-funded Kiev junta. In 2017, South Ossetia plans on holding a referendum to join the Russian Federation. Eastern Ukrainian regions also plan a referendum in 2017. Watch this space for externally-initiated unrest closer to the time. “We consider saboteur groups’ penetration of Crimea to be an extremely worrisome phenomenon not only for Crimea, but for all regions bordering Ukraine. Earlier, extremist forces such as Right Sector announced Ukraine’s territorial claims to Russian territories – above all, the Voronezh, Belgorod, and Kursk regions. Now is a very worrisome moment as the economic situation in Ukraine is deteriorating and the ruling clans’ resources from the further plundering the population are dwindling. Europe is losing interest in Ukraine. 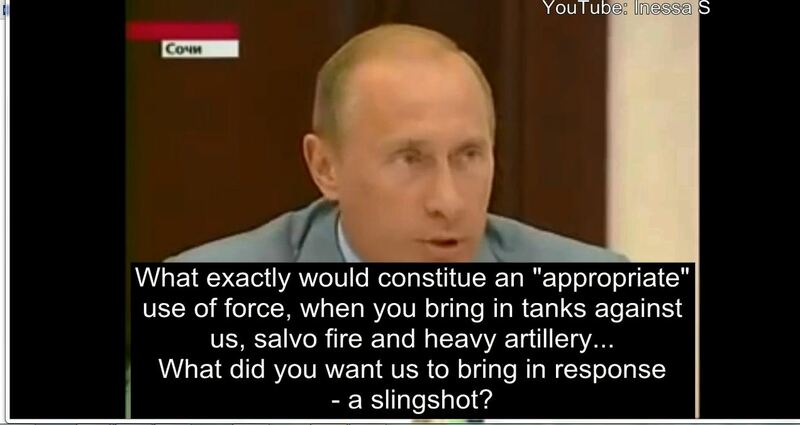 There are plans to drag Russia into a big war and provoke a coup by radical forces in Ukraine.